Stylish Ghana Braided Ideas To Try Out In 2019 With Beautiful Photos - BlogIT with OLIVIA!!! Hair-lo (hello)guys, this is 2019 and here am I still wondering the braided hairstyles to experiment with this year. We should be thinking of how to take it all the way. There should be no room for boring hairstyles. Not at all. Your hairstyles this year should be on fleek. C'mon, that's why this blog is in existence in the first place. To show you ideas and insights on how to take care of your kinks (natural hair). Not saying the styles are basically for people with natural hair, nope. All hairstyles placed on this site can be worn on both relaxed hair and natural hair. Having said that, let's get to the business of today. Lol. 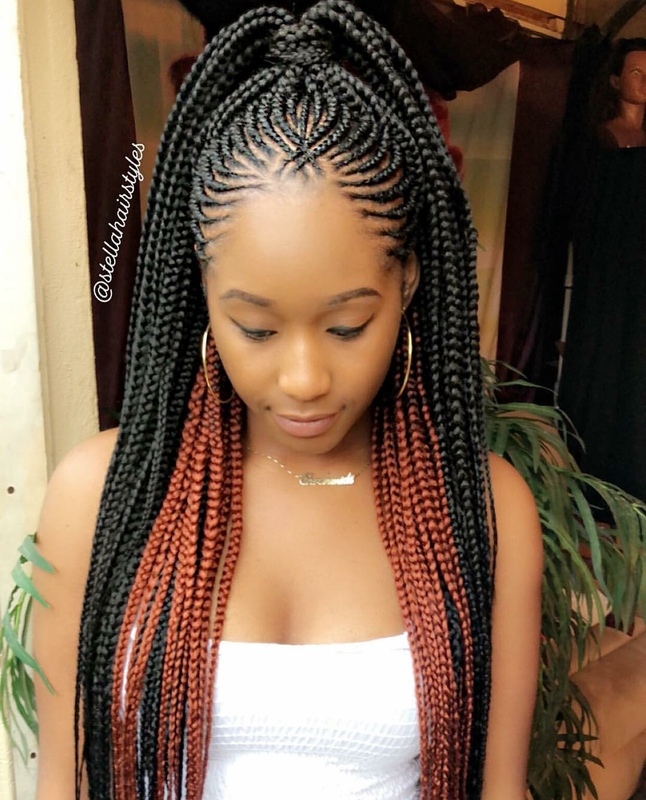 Okay, so I actually have been following the trend on Ghana braids and to be sincere, hair stylists are going all the way. Guys, they are changing a lot of things and are overly creative with styles. 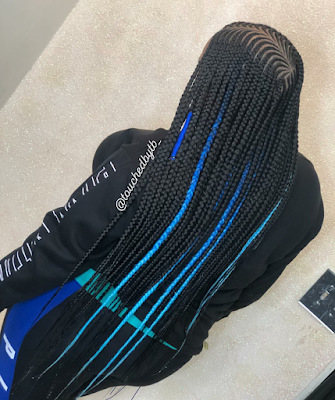 I was on the @africanahairstyles page on Instagram a few days ago, collating pictures for the latest trend in Ghana braids and I was really wowed at the improvements and the creativity surrounding Ghana braids. Ghana braids aren't what they used to be. Oh boy! 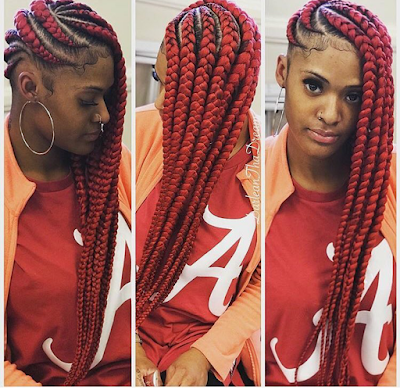 These hairstylists aren't playing with anyone. I had my hands full on the best and most stylish Ghana braids that I believe would be in trend this 2019. Ghana Braids for 2019 is what they are. 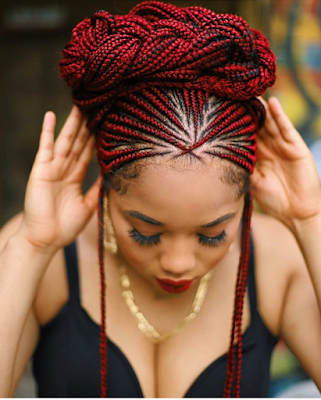 Let's look at some of these Ghana braids styles. Ponytail ghana braids have been in existence. Like, there's absolutely nothing special about just pulling up your puff in a ponytail, just kidding. 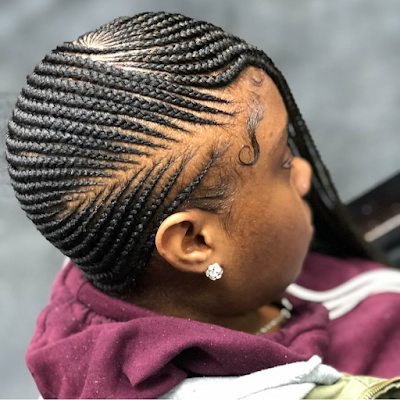 If you take a close look at the first photo, you will understand that there's a lot of special and unique things about ponytail ghana braids. The first photo is not the conventional ponytail ghana braids you know. it was accessorized with colors, sophisticated patterns and it's what every woman would want to out. 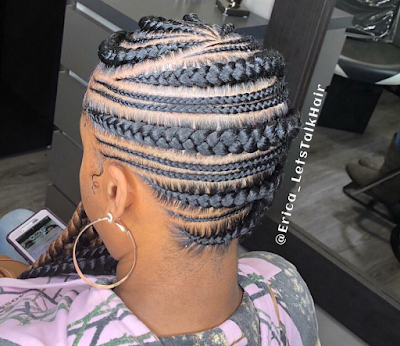 You can check out other ponytail ghana braids below. If you are into ponytail braids, then opting for any of these ponytail ghana braids might be a good idea. Side braided ghana braids come in different patterns and styles. I have seen a whole lot of this style that I always had a hard time picking the one that's best suited for me. 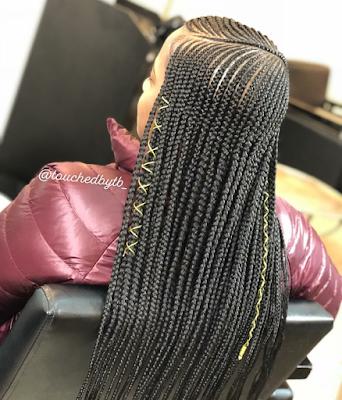 The funny thing is that no matter how hard I've tried to try this particular style of Ghana braids, I always change my mind when it's time to get my braids on. I always preferred all back Ghana braids. Not to say all back Ghana braids are better but I think it fits me much more. 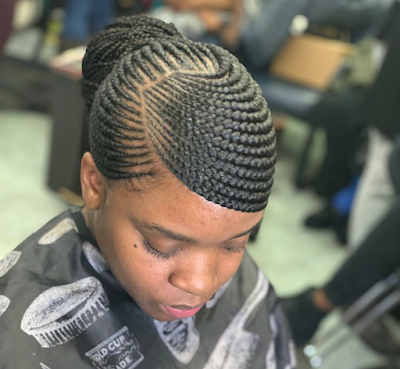 Not to say I will never try out the side braided Ghana braids, matter of fact, that will be next move. 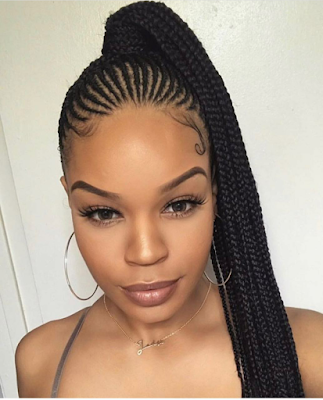 My next braided hairstyle will be exactly this one above. Maybe it's because it's more of cornrows and its bigger in size too. I hate having to sit down for hours because I was trying to look beautiful. lol. I know a lot of women feel that same way too but beauty is a pain they said. So we don't have much choice or do we? Colorful braids are one of my weaknesses. I can't stay away from this particular color. Does magic to my look, I swear. 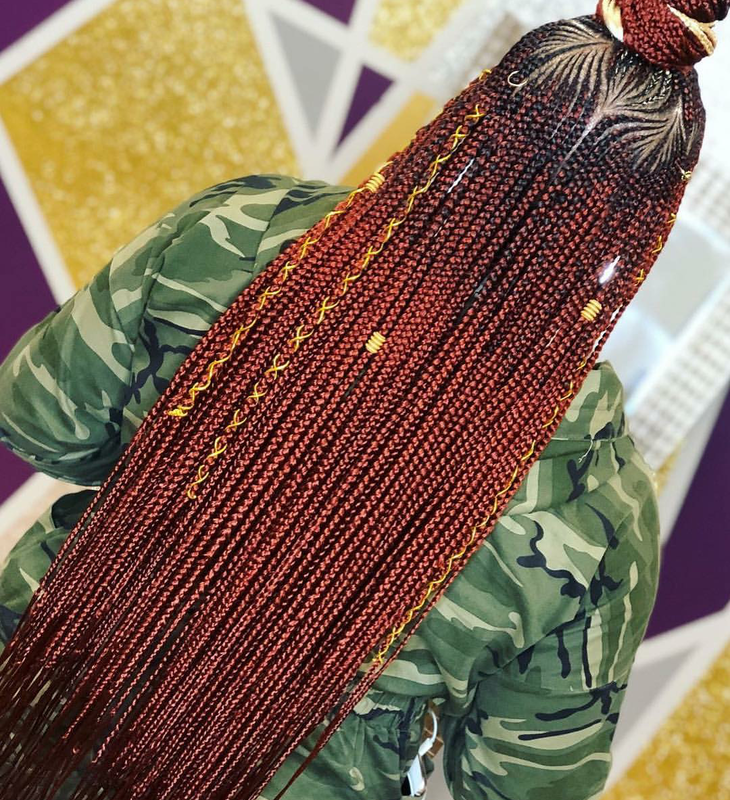 This is the last Ghana braids style that I would be talking about on this post. The center-parted ghana braids is another beautiful way of rocking your ghana braids this 2019. There are two ways to get this done. 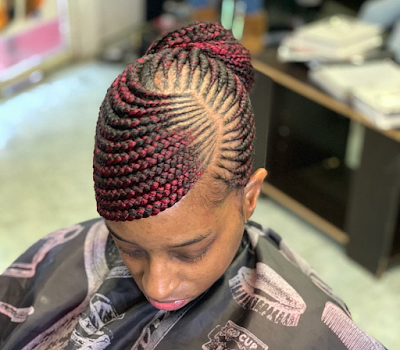 It's either a line is allowed to go straight from the center of your front scalp down to the back or a single Ghana braids is drawn from the front scalp down to the back. The picture about clearly depicts the line without braids while the picture below showed a single drawn Ghana braid. Either way, they are still a cool way of rocking Ghana braids sideways. First of all, make sure you are visiting or booking an appointment with a good hairstylist. This is very important as there are many people parading as hairstylists but cannot do the work very well. They will braid exactly opposite of what you asked them to do for you. Secondly, please make sure your braids are not tight. Tight braids should not be your friend. They are your hair's enemies, please. lol. Ghana braids are painful on its own. If you happen to meet someone that has very painful hands and have your ghana braids woven for you, rest assured that you ain't getting no sleep that night. I have experience with such. Finally, a style that will fit your face matters. If you know it wouldn't fit your face, don't go for it. You might end up not liking it. Now, you can pick a style that you think is great for you and go for it.